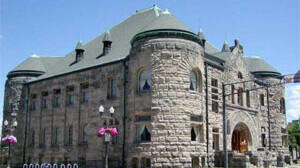 The Mabel Tainter building includes a lavish 313-seat "crown jewel" Victorian theatre and a historic reading room. It is a premier example of a restored vintage American Theater. Take a self-guided tour to inspect the intricate hand-stenciling, hand-carved white pine archways, rich walnut, mahogany, and oak woodwork, gleaming brass fixtures, leaded glass windows, and a rare working Steere and turner tracker pipe organ with 1597 pipes.